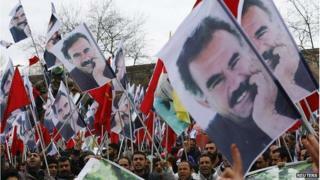 The jailed leader of Turkey's main Kurdish rebel group has urged followers to end a 30-year armed struggle. In a statement read out on TV by a Kurdish MP, Abdullah Ocalan said he was seeking a "historical decision" to reach "a democratic solution". He called for a special congress in the spring intended to make a declaration ending the armed conflict. More than 40,000 people, mostly Kurds, have died in fighting for a Kurdish homeland in Turkey's south-east. Mr Ocalan leads the Kurdistan Workers' Party, or PKK, but has been in prison since 1999 serving a life sentence for treason. Announcing his latest view, Kurdish politician Sirri Sureyya Onder read a message on Turkish TV. "We are in the process of bringing an end to the 30-year of conflict, in the form of a perpetual peace, and our main goal is to reach a democratic solution," Ocalan's message said. This is the most important step in Turkey's efforts to resolve its Kurdish question since 2013, when Ocalan declared a ceasefire. Many at the time predicted that the peace process would be short-lived, but two years on the ceasefire has held with some minor breaches. Now, it seems that the group has agreed to decisively end the armed campaign against Turkey. Ocalan previously made it clear he would not make such an announcement unless the government entered into formal negotiations, discussing concrete steps for a peaceful resolution. His statement, read in the presence of senior government officials, suggests that the government might have agreed to that demand. "I am calling on the PKK to convene an extraordinary congress in the spring months, to make the strategic and historical decision about ending the armed struggle based on mutually agreed principles. "This call is a historical declaration of intent on replacing the armed struggle with democratic politics." Abdullah Ocalan retains influence over PKK commanders and soldiers and analysts say his messages from prison are often heeded. He declared a ceasefire in 2013 that holds despite ongoing mistrust between the two sides. The BBC's Rengin Arslan, in Turkey, says Abdullah Ocalan's call comes at a critical moment for the country, which is facing parliamentary elections in 2015 and a national debate over a security bill seen as draconian by critics.